We know that the date is the least important part… but isn’t it terrific that there is a calendar day we can celebrate with them to thank them for their unconditional love. It’s just that they are a treasure! Generous, understanding, hardworking, patient… all the positive adjectives fit them because they put up with everything! There’s no cooler dad, and that is something not all the gold in the world can buy. That’s why we’ve prepared a list of very neat sentences that you can say to him today on his day. Choose the ones you like best and that identify with him. We are certain you will impress him! Do you know the origin of this celebration? This beautiful celebration started in the United States back in 1909 when Sonora Smart Dodd wished to pay tribute to her father, Henry Jackson Smart, a US Civil War veteran. Henry’s wife died when giving birth to their sixth child and he looked after and educated all his children with no help and with all the love in the world on a farm in the state of Washington. Isn’t that a dear story? It stole our hearts. We, in boboli, have lovingly prepared a unique collection dedicated to dads for this very special day. With Family Team, we want Father’s Day to be educational as well as fun. There are five models for the entire family with different messages to face the challenge of educating with a sense of humour. 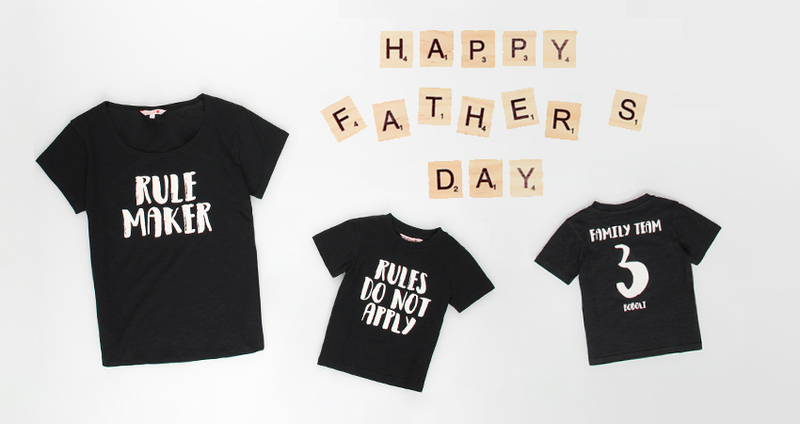 Superb T-shirts for dads and moms that set the rules and, so that the young ones learn, also put their limits to the test, sometimes even daring to break them! Perfect colours for the best team in the world!